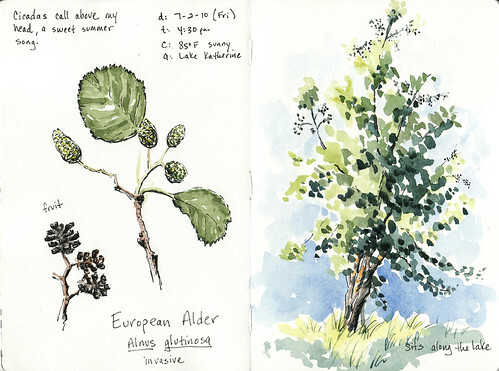 Alder Tree Sketch – Let's Paint Nature! This is a European Alder tree, Alnus glutinosa, growing along side of Lake Katherine. What caught my attention was the fruits growing near the top. From a distance, I thought they were berries however, when I inspected them up close, I found some neat looking “cone” shape fruits. This deciduous tree’s fruit reminds me of pine cones, I really like them. Unfortunately, I learned that the European Alder tree is invasive on a site called, Invasive Plant Atlas , a great site which lists tons of invasive species in the US. Here’s my question: If the Alder is invasive, why did the staff of Lake Katherine plant it? What you do not see in this sketch is a wire fence protecting the bark from beavers. Perhaps they did not plant it but it grew from a seed, then maybe they should remove the fence and let the beavers have at it?!? Drowsey: I’ve missed you! You’ve been missing! Glad to hear from you. I think I was out of town and then found this post today and had to comment. First–fantastic sketch page. We also have problems with invasive species–some are worse then others. For instance, that garlic mustard is bad as you say. It’s been invading along the creek where all the bluebells are. I pull them up every time I saw them along the creek–very big job but they are easy to pull up.